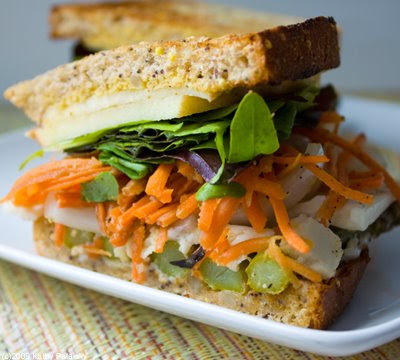 Veggie Stack Sandwiches! What's Your Inspiration? Veggie Stack. 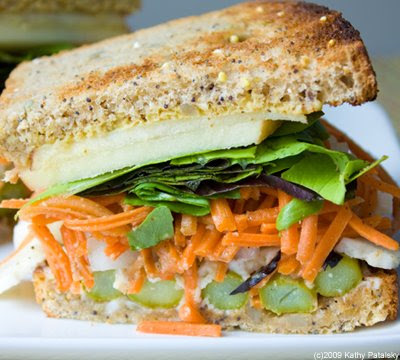 The idea of a veggie stack sandwich has been around for decades. You simple pile on the veggies and even fruit and slice away! My favorite 'vegan sandwich' to-go in NYC is from Cafe Angelique in SoHo. They stack up the sandwich with so many layers that I always wonder how they manage to slice the bread! Back when I was a little California girl running around the beaches of Nor Cal, I fell in love with a Veggie Sandwich at a local beach side deli. It had pickles, lots of California avocados, romaine lettuce, spinach, tomato, artichokes, onion, peppers, olives, spicy mustard and Munster cheese - all between two soft layers of Santa Cruz Sourdough bread. I wasn't vegan back then, but I was addicted to it! Since I was still a food-exploring kid, it made me realize that a sandwich can be cravable and amazing-even without meat. And oh boy I loved that sourdough bread with the super soft insides and chewy firm crust outsides. Bliss! How to Stack. 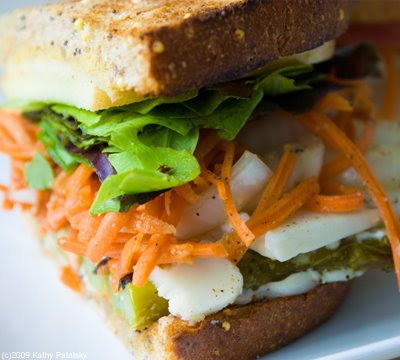 The key to stacking and slicing a big veggie sandwich is care, sturdy bread and toothpicks! I will usually add two toothpicks to my sandwiches for extra slice support. A firm, yet gentle palm will also help you slice a stacker. 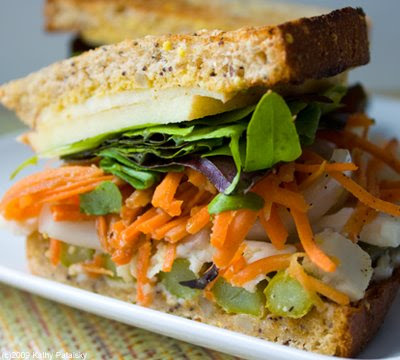 The two most important factors to a Veggie Stack sandwich are: good fresh sandwich bread and delicious fresh ingredients. My rule: if it tastes great on it own, it will be divine in a sandwich. 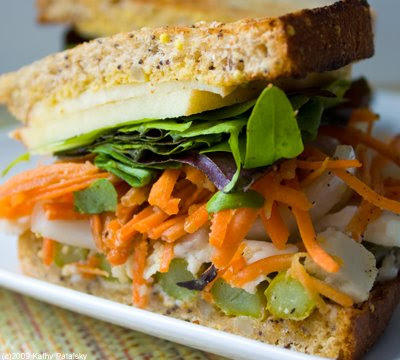 If you don't like shredded carrot slaw on its own, don't stick it in your sandwich! *I used Whole Foods 365 brand Birdland Seeded Bread. Toss and chill in fridge for 10 minutes before adding to sandwich. 1) Lightly toast the bread. 2) Add any spread to bread. 3) Add the cheese first if you want to place the bread and cheese under a broiler for a few minutes to have a 'Melty' Stack sandwich. Otherwise add the cheese in order of its weight compared to the other ingredients. 4) Add the heavy veggies first: the asparagus. 6) Add the carrot slaw. 7) Add the mixed greens. 8) Add the flat sliced apples on top-they will mesh well against the flat bread. 9) Add any optional salt, pepper, oil, vinegar to the top of apples. 10) Add the top layer of bread-a few toothpicks, and slice!